Here's something to aspire to. 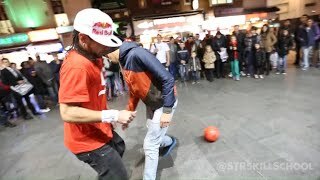 Check out these amazing street football skills from Séan Garnier! Definitely some handballs in there !  Sponsored Dribble at Wale Rec Come and joint the sponsored dribble on March 22nd at Wale Rec. It's in aid of the new pavillion, so you know it makes sense ! Football Kickstart Day at Linton Village College on Sunday 23rd February 2014  The aim of the day is to engage with as many children and young people with cerebral palsy with FA Qualified coaches delivering fun football activity.